Chancellor Woodson addresses members of the Pullen Society during the 2015 celebration, which took place June 12 at Carter-Finley Stadium. NC State has inducted 60 new members into its R. Stanhope Pullen Society. Established in 1993, the Pullen Society recognizes individuals who are providing critical support for the university through deferred gifts such as charitable remainder trusts, gift annuities, life insurance and will bequests. Since its creation, the society—named for the man who donated the original 62 acres for the educational institution that became NC State University—has grown from 173 charter members to more than 1,200. The chancellor hosts an annual event to honor Pullen Society members. At the event, new members are inducted and receive certificates from the chancellor, and guests enjoy an inside look at one area of NC State. 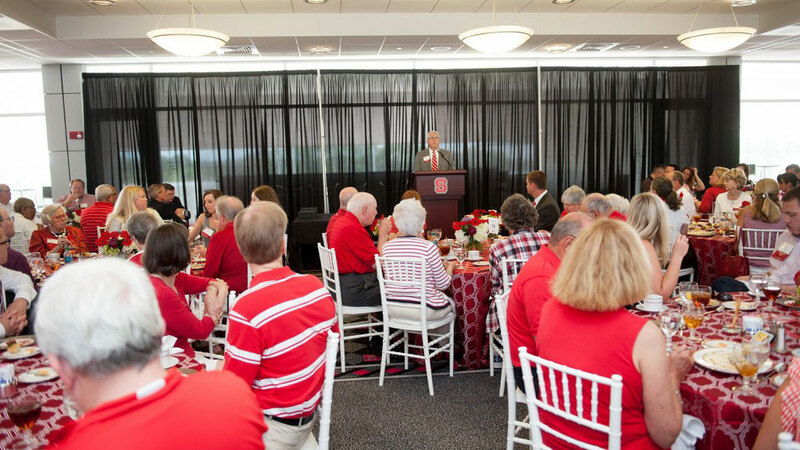 More than 200 people attended the 2015 Pullen celebration, which took place June 12 at Carter-Finley Stadium and highlighted the athletics department. Pullen Society members had the opportunity to be photographed alongside NC State mascot Ms. Wuf on the stadium field, to peek at the recently completed Close–King Indoor Practice Facility that will be used by several teams and to take a behind-the-scenes tour of the Wendell H. Murphy Center that serves as the home of Wolfpack football. They enjoyed lunch in the Dail Club at C. Richard Vaughn Towers. Chancellor Randy Woodson praised the advances being made under the leadership of Debbie Yow, director of athletics. Off the field, achievements range from improved academic performance and athlete graduation rates, to the establishment of an Athletics Hall of Fame. On the competition side, Woodson noted that when Yow arrived five years ago, NC State had most recently finished 89th in the NCAA Division I standings for the Directors’ Cup. The Cup measures an athletics program’s overall excellence based on its finishes in up to 10 men’s and 10 women’s sports. “This year, we believe the highest finish in school history is within reach, even possibly our first top 25. That’s a tremendous testimony to our student-athletes, coaches and staff,” the chancellor said. He added that the same momentum and gains shown in athletics are happening across campus—driven by high expectations and measurable goals, dedication and broad commitment, including from private donors. “We need your passion and your support,” Woodson told the group. Jack Tocho, a member of the Wolfpack football team, spoke as a representative of more than 500 student-athletes. Tocho, a first-generation American whose parents emigrated from Kenya, said he enjoys amazing academic, athletics, extracurricular and service opportunities at NC State. 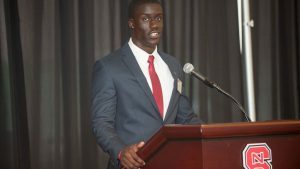 He spoke about his pride in representing the university to the community and in finding out that he would receive an athletics scholarship. The legacy of Pullen Society members touches every college, as well as the arts, athletics, libraries and other programs across the university. Members invest in scholarships, fellowships, professorships, research initiatives, facilities and more. “Your generosity and commitment are absolutely critical to NC State’s success,”Brian Sischo, vice chancellor for university advancement, told Pullen members.